Often, customers install vinyl fences in Dallas because they want privacy from their neighbors and passers by. It’s ironic, then, that fences can cause many of the disputes they’re meant to help avoid. Putting in a new fence on your property without consulting your neighbors, and without following proper neighbor etiquette, is like asking for trouble. To help you avoid any neighborly disputes over your vinyl fence, we’ve put together some tips for installing your new fence problem-free. Check the Property Lines – Property lines are one of the biggest causes of fencing disputes, so it’s vital that you check the property lines before getting your new fence installed. Don’t just rely on where your old fence was or what you’ve always thought the property line was. Doing so could land you in hot water if your neighbor takes issue with the fence. Instead, hire a surveyor and study the property map or plats to be absolutely sure your fence is where its supposed to be. You can also ask your Dallas vinyl fence company to install your fence slightly inside the property line to be sure it’s safe. Obey Fencing Regulations – Every township has its own specific code rules and regulations for fencing, and not knowing what they are isn’t an excuse for doing the job wrong. Your vinyl fence company will probably know the rules for your area, but double check your fence against the code before it goes up. If you don’t, you could be forced to tear it all down and redo it on your own dime, plus pay a fine. A non-regulation fence can also affect your neighbor’s property values, leaving them upset. Respect Your HOA – If your neighborhood has a homeowner’s association, make sure to clear your fencing project with them beforehand. Just like with city codes, you’ll need to either provide the HOA with plans or run the design by them to ensure it fits within their statutes. If it doesn’t, they might fine you or order you take it down – and your neighbors might also complain about your non-regulation fence. It’s much easier to get the proper clearance first than to deal with all the headaches after. Share Fencing Intents Beforehand – One good idea that will help smooth over any potential fencing disputes is to let them know about your plans to install a new fence before you begin installation. You don’t necessarily have to show them your plans – the fence is on your property, after all – but it can help if you think your neighbor might be interested in paying for part of it. However, you should show them where you intend to place the fence, and let them know if there are any property line problems you discovered when you ordered the survey. Ensure Your Fence Doesn’t Stand Out – A sure way to invite the ire of your neighborhood is to install a fence that looks out-of-place for its surroundings. Even if you personally like a particular fencing style, try to match the look of your neighbors’ houses and fences to keep the neighborhood looking good. A vinyl fence is a great way to keep your property looking nice season after season, since they don’t break down or rot over time. They also come in a variety of colors and styles to match the look of any neighborhood or development. Install it the Right Way Around – In addition to choosing a fence design that matches the look of your neighborhood, you should also install your fence so that the fence rail (if your design includes one) is on the inside. One benefit of vinyl fencing is that the panels often look the same on both sides, making it easy to get a clean and finished look on both the inside and outside of your fence. With a vinyl fence, there’s no “nice side” to worry about – every side is the nice one! Maintain the Fence – When you install a fence on your property, it’s your duty to take care of it and make sure it looks good on both sides. Vinyl fences are a perfect way to lower your maintenance obligations. Vinyl doesn’t need heavy cleaning or staining to keep it looking good year after year – it will keep its good looks for a long time all on its own. Do you want to know more about installing a fence in Dallas without causing neighborhood problems? Call us today at Future Outdoors®! 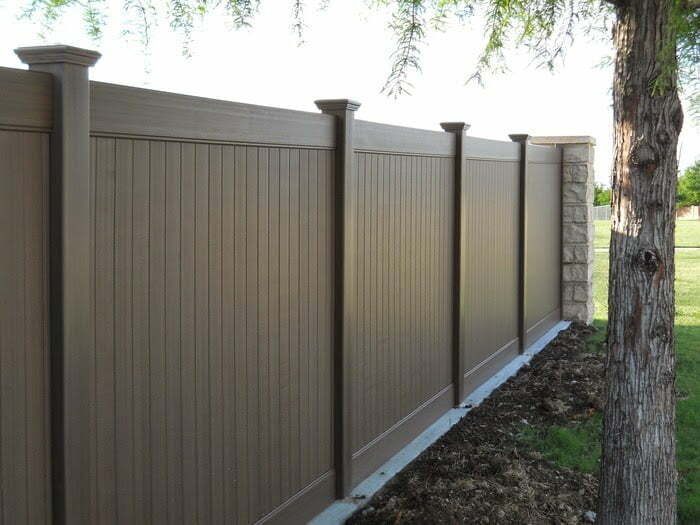 We’re the number one provider of vinyl fence and vinyl structures in the Dallas-Forth Worth metro, and we’d be happy to bring our experience and expertise to your vinyl fence project. Just call today at (972) 576-1600 or visit our Facebook or Twitter pages to learn more.